As you all know, my hair is pretty important to me. I am really trying to gown it and not dye it/bleach it so much so it has a chance to be healthy and grow. It is important for me to us haircare specific to repair my hair and prevent damage. This range is suitable for all hair types but is perfect for those suffering with dry and damaged hair. I have been using both the shampoo and conditioner together for the last couple of weeks and I have really noticed that my hair is a lot more manageable when I towel dry it. It isn’t nearly as knotty as it used to be and my hair feels a lot more hydrated whereas before my ends were so dry I used to have to put so much oil on them! I have always been a big fan of anything with coconut oil in anyway and quite often put raw coconut oil on my hair when it’s damp. I am really impressed with this range. it is also safe to use on colour treated hair as it does not contain sulphates. Do you have any hair products to recommend for damaged hair? AOOOOOO I love this! I only use no sulphates, no parabens hair products because I had my hair straightened this year, and it’s really hard to find the kind that actually feels nice while using.shea butter and coconut oil? I’m sold! This sounds like really nice shampoo. 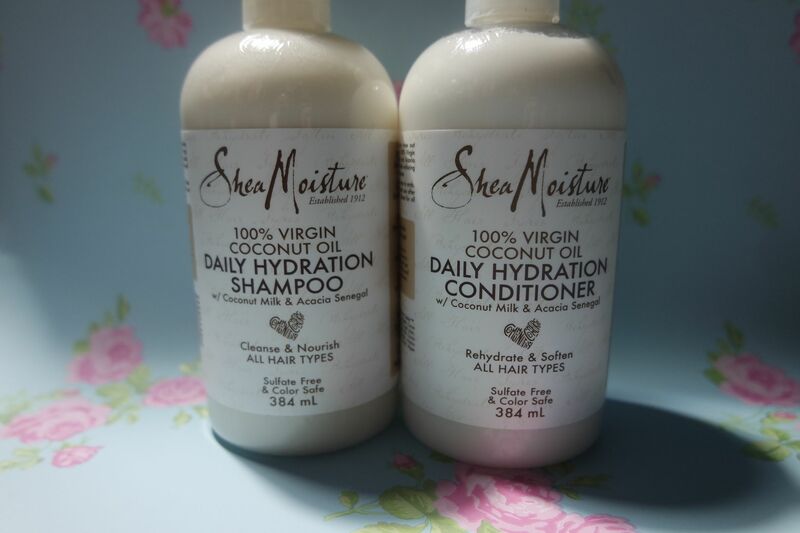 I always use shampoo with no sulphates, parabens or added chemicals. I used to use a vinegar and baking soda rinse on my hair – it’s surprisingly cleansing. When my hair was dyed (and really dry and damaged) I used that rinse, and also a lot of natural, organic shampoos (mostly tea tree). These sound like fab products. Your hair really is amazing! These sound like what I need in my life right now, my hair is so damaged and dry atm. I’m naturally dark headed and have went blonde so I reckon it’s the bleach that’s killing my hair! Thank you for the recommendation chick! I didn’t know this brand had a shampoo/conditioner line! I’ll have to try it. I love anything with coconut oil. Your hair is sooo cool! MY hair hasn’t really been enjoying the colour-treatment shampoo and conditioner I’ve been using on it! It certainly sounds like Shea Moisturiser could be the perfect replacement for it – I can’t believe how many benefits there are in terms of it being cruelty free, paraben free etc! I bet they smell ~amazing~ too! I have been trying this out too and loving it! I have been loving using these they make my hair so soft!